This product is from our marketing inventory. The box has been opened and the software has been updated. There are 3 available in new condition. The hub of your modern science classroom, the SPARK LX is the ideal platforms for PASCO sensors, while providing a connected, easy-to-manage learning environment powered by SPARKvue software and the Lab Manager application. 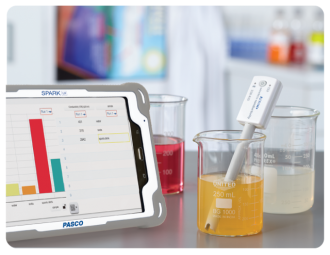 PASCO’s new datalogger blends software and hardware for data collection and analysis along with classroom management capabilities, all on one device. The SPARK LX is for use with PASCO Wireless Sensors (or for PASPORT Sensors with the AirLink). It comes with five virtual ports for simultaneous wireless connection.